There are few things in the world that are more satisfying than sitting down in front of a nice, flavorful bowl of pasta. Seriously, I love a good bowl of pasta! It is a perfect symphony of flavor, texture, aroma, and pretty well speaks for itself. Of course, at the core of any good pasta dish is, well, the pasta. So, that is the focus of this post. We aren’t talking just any pasta, but homemade pasta. I am always up for learning new techniques and tricks when it comes to all things cooking. So a few months ago I decided to sign up for a cooking class learning how to make fresh homemade pasta. Needless to say, I had always been curious how this could be done, but I was uncertain if I could master the skills needed to make my own pasta. 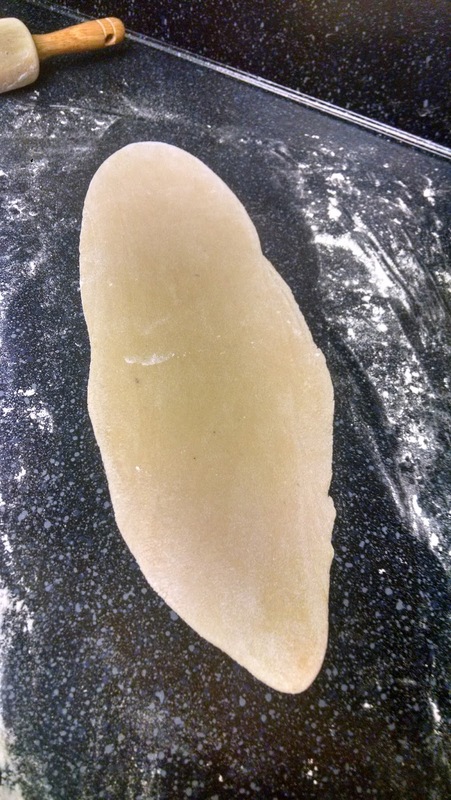 The ingredients from fresh pasta are simply flour, egg, water, salt, and oil. That is it. The real trick was bringing the dough together. This is a little more challenging, but like our mayo recipe, you just need to trust the process and you will be okay. Your trust, Grasshopper, will be rewarded with delicious, easy, and super-versatile pasta. Ready to get after it? Let’s go! On a clean surface on your kitchen counter, combine salt and flour into the shape of a mountain. You can do this in a bowl, but you might find it easier to work with more open space. Do what works best for you here as there is no right or wrong way to make dough. Form a well (or a slight pocket) in the top your mountain of flour, and add the beaten egg and oil to the well. Sprinkle kosher salt and ground pepper on top of the oil and egg, as well as around the rim of the well in your flour. 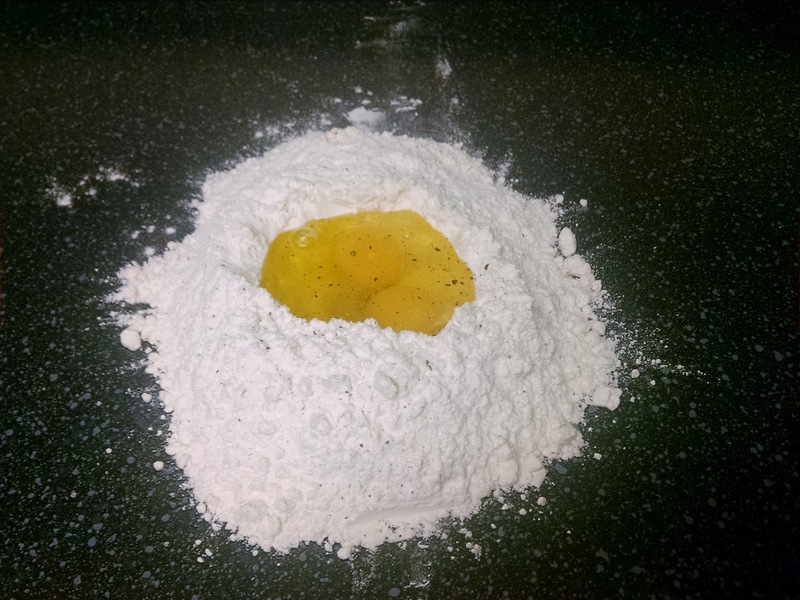 Slowly, with a fork, start to bring the flour together with your egg and oil in order to combine. Combine the egg and flour mixture using the fork until the dough begins to clump and you can’t use a fork to combine the mixture any further. You will want to use your hands to begin incorporating this initial stage of the dough together, and it can take a little time to get the ingredients incorporated so be patient. Also, don’t worry if all the flour doesn’t get worked into the dough at first. **If you notice the dough looks dry and isn’t absorbing the remaining flour you should add a 1 tablespoon of water at a time to help moisten the dough and incorporate the additional flour. Don’t add all the water at once otherwise your dough will be far too wet. It is easier to add a little at a time until the dough is incorporated with all the flour rather than ending up with a lot of wet dough! Once the dough begins to form a ball and all the flour is well combined, knead the dough and look out for little bubbles of flour or other substances that haven’t mixed together thoroughly yet. 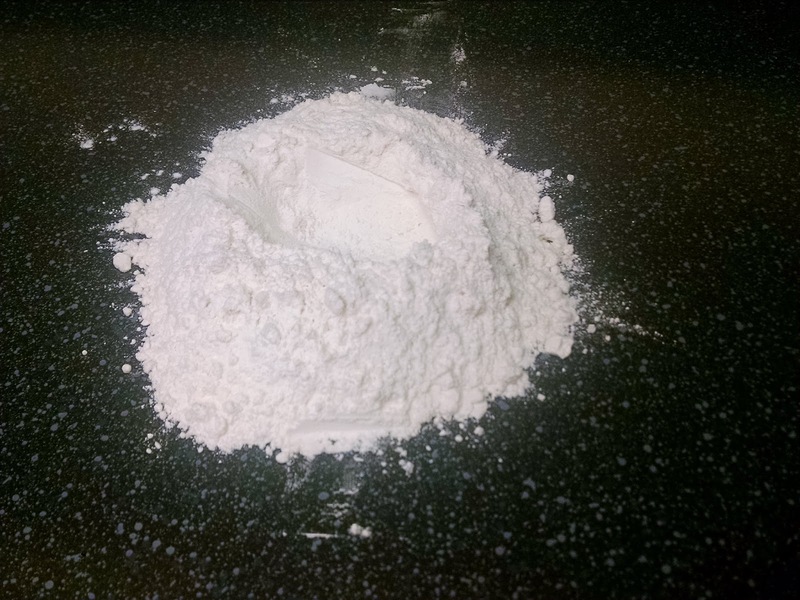 If the dough is sticking to your bowl or surface, just add a little bit of flour to keep it from sticking. Keep kneading until you get one smooth dough; it will feel like the consistency of play-doh when it is combined properly. If the dough feels dry from absorbing any extra flour just add a little more water by wetting your fingertips and work that into the dough to moisten it. I don’t expect you will need very much water, but it is good to have if you feel you want a touch more moisture for your dough. Here is the dough as it starts to come together.This dough was pretty wet, so I did have to work in more flour to get it to the proper texture. 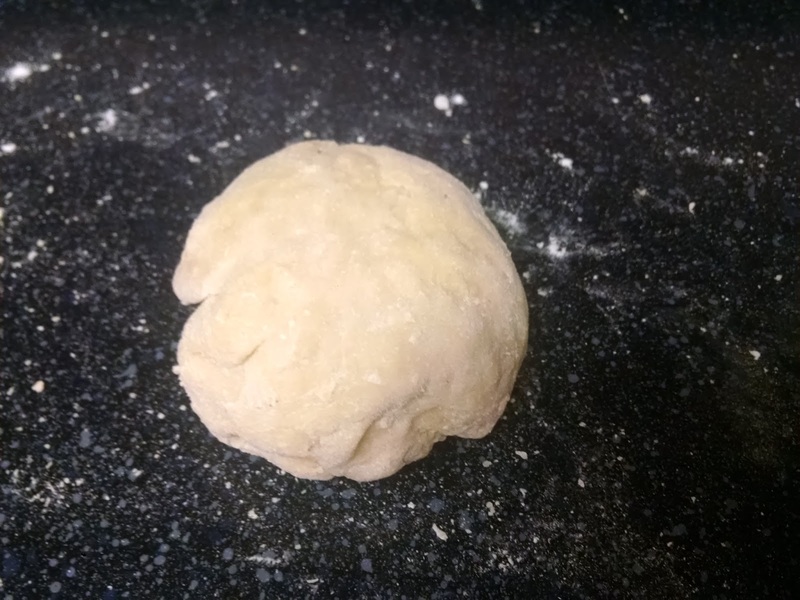 When the dough is finished ball it up into a roughly shaped disc of dough on the counter and either wrap it in plastic or simply cover the dough with a towel and leave it on the counter to rest at room temperature for 10 minutes. At this point you can roll the dough out and prepare it for cutting into pasta, but only if it will be used right away. If not, wrap in plastic wrap and store in the fridge for up to 24 hours. Note: After 24 hours you may notice the dough in the fridge will begin to oxidize. Although it won’t impact the the flavor of your dough and your ability to roll it out, it could give the dough a grayish hue. 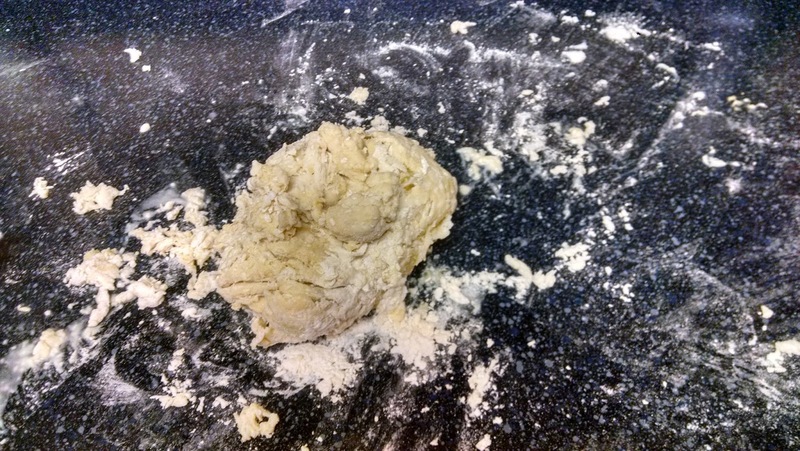 To roll out the dough successfully, I suggest starting with half of your dough as the whole ball can be hard to work with and you may not have the room for the entire ball once rolled out. I suggest using a dough blade or a bench scraper to section your dough. If you don’t have one, I recommend getting one or two as it is simply a flat, thin, plastic blade that allows you to scrape the counter when combining the dough ingredients, move or cut the dough easily. You can find these very easily, even at the dollar store and it is such a useful tool for any type of dough or pastry. I find it particularly useful when I am forming the dough and some of the egg and flour haven’t yet been incorporated together. If you don’t use the other half of your pasta dough right away sprinkle it with flour to keep it from drying out on the counter, or wrap it in plastic and throw it in the fridge to use later. Next up, we will cover rolling the dough out to proper thickness for pasta and raviolis. It is going to be amazing! Here is a shot of the rolled out dough. Although I am going to get into cutting pasta and crafting raviolis next time, and the different types of pasta you can make by hand, this gives you an idea to start with. One last note, even if you follow the recipe, the dough can be impacted by the humidity and temperature in your home, altitude, and the amount of any moisture in the flour you’re using. So, keep this in mind, as you have may to adjust the recipe with more flour or water even though you have followed it exactly. Be sure to check my next installment in Pasta-Palooza! Enjoy!